Three of the big winners of the new InterBrand global brand ranking took the Times Center stage on Thursday to talk about how their brands have managed to establish a valuable identity. Jez Frampton, global CEO of the firm, said strong brands -- business strategy brought to life -- have enduring value. "Coca-Cola has been number one for 13 years because of its incredible ability to create long-term engagement," he said. 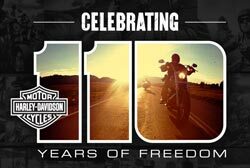 Big winners this year including Microsoft and Harley-Davidson enjoy that kind of enduring value. Their marketing chiefs, along with that of UPS, took the stage to explain why. Mark-Hans Richer, CMO at the Milwaukee-based Harley-Davidson, had a lot to say about the enviable relationship the motorcycle brand has with its owners. "Customers control our brand," he said. But flashing a photo of what used to be the stereotypical middle-aged bald biker dude with the Harley tattoo, he also said the key to growth is not to make brand imagery sacred. To bring in new, younger consumers, he said, everything had to change. "The journey we are on is about taking a strong brand equity centered in one customer type and growing that to many other customers, to scale that passion. The important thing is not to obsess with the logo. A brand is what it means in hearts and minds of customers. The logo isn't holy." When he was in his fifth month on the job (he's been at H-D for five years) the company rolled out a new identity in a way that turned out to be relevant to young adults. First came a new logo, the #1 skull -- a racing-style numeral 1 with a skull ensconced in the crown of the number. "Eight months later I met this guy in Houston," he said, projecting a photo of a younger guy with the #1 skull tattoo. "It made me see how quickly the passion could be recaptured in equity that didn't exist a year before." Harley-Davidson also found a way to explain the affordability of its bikes without compromising the brand with low-cost models. "We didn't lower prices, or come out with cheaper bikes, we told [younger prospects] what it costs within the context of their own life choices." Ads suggested they could own a Harley-Davidson with monthly payments that would be less than boozing, overspending at coffee shops, or engaging in a tobacco habit, among other habitual payouts. Richer says the campaign paid off, with 40% of the brand's Facebook fans between 18 to 34 years old, a 10-point gain in market share with young adults. Jeff Hanson, general manager of brand strategy at Microsoft, says this year will be huge for the company, as it continues its "Life Tiles" content format, and corporate brand redesign. "We will be shipping new versions of every product in our portfolio," he said, adding that the key idea both for product and branding is shared design: "A common look and feel across products." Life Tiles plays informs everything from apps to the corporate logo. As an app, Life Tiles constitute a real-time billboard constantly presenting information. The same format is employed on Windows 8, Xbox and Windows Phone. "Applied to brand strategy, the common look and feel across brands makes it easier for customers to use multiple products, and customers are wanting and demanding that fluid end-to-end experience." The new corporate logo, no longer an ideogram of a physical window, is a square life tile image comprising four colored tiles is meant to celebrate diversity, per Hanson. Richer said the one-word meaning for his brand is Rebel, the verb, not the noun. "It's not just for customers but employees as well, to execute against the brand. We created a brand legend, with reBel [sic] at the center of it. It's about personal identity, being your truest self and having the courage to be that. If we do have strong brand loyalty it's that owners aren't loyal to us, but to themselves." As a side point, Richer did a group ride through China to Tibet recently, as part of the company's 110th with Chinese dealers. He said they stopped at 16,500 feet at a symbolic rock outcropping where people repaint Chinese characters carved into the stone. He asked someone to paint in Chinese characters what Harley-Davidson meant to him. He painted characters for "freedom." "We are sending it around the world. It was blessed by the Pope." I guess that's the ultimate brand endorsement.